Celebrating the life and legacy of one of America’s best-known religious figures in words and photographs, this book traces the amazing journey of the lanky farm boy from Charlotte, North Carolina, who grew up to preach to more than 200 million people in stadiums and arenas around the world. 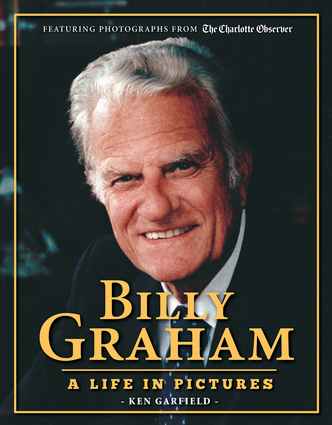 Written by a journalist who covered Graham and his ministry for more than a decade, Billy Graham: A Life in Pictures chronicles the preacher’s rise, his friendship with U.S. presidents, his spectacular crusades, and his work in building a religious organization that continues with his son Franklin as its leader. It also offers a glimpse into Graham’s rich family life and how he managed to maintain his integrity while other religious personalities, despite—or perhaps because of—their large followings, were losing theirs. The book provides a fitting tribute to one of the most important religious leaders of the 20th century, a man of unimpeachable character who influenced millions around the globe. Ken Garfield is the director of communications at Myers Park United Methodist Church and the former religion editor for the Charlotte Observer. He lives in Charlotte, North Carolina. The Charlotte Observer is the most-circulated newspaper in North Carolina. Its original incarnation was founded in 1886, and the paper has received four Pulitzer Prizes. Billy Graham was featured on UMC.org, the website for the United Methodist Church. Billy Graham was featured on the website for The Herald. Billy Graham was featured by author Ken Garfield, on the website for The Winston-Salem Journal. Ken Garfield, author of Billy Graham, was interviewed on WBTV-TV. Ken Garfield, author of Billy Graham, was interviewed on WCNC-TV. Ken Garfield, author of Billy Graham, was interviewed on WSOC-TV. Growing up on a dairy farm in Charlotte, North Carolina, Billy Graham's interest in Evangelism began as a teenager, but at the time no one could have guessed the extent to which this man would influence religion across America and around the world. Throughout his life, Graham has preached to more than 210 million people in 185 countries and territories. Billy Graham: A Life in Pictures celebrates one of the most influential religious figures of our time. This book is a great introduction for those who are curious about Graham's life and a must-have keepsake for close followers of his ministry. Ken Garfield is the director of communications at Myers Park United Methodist Church and the former religion editor for the Charlotte Observer. He lives in Charlotte, North Carolina. The Charlotte Observer is the most-circulated newspaper in North Carolina. Its original incarnation was founded in 1886, and the paper has received four Pulitzer Prizes.